The Bible is an excellent example of ancient literature, dating from the mid-1st millennium BCE through the first century of the Common Era, even with its historical inaccuracies and theological biases. The importance of the Bible in these terms cannot be overstated. However, as with many ancient legends, one should not allow the religious connotations of the Bible as the holy text of Christianity to blind oneself from the highly derivative nature of many of its stories. Rather than a product of original teachings and divine inspiration, significant portions and many vital moments of the biblical narrative, in both the Old and New Testaments, are, in fact, drawn from far older religious traditions including Zoroastrianism, Buddhism, and the beliefs of Mesopotamia. 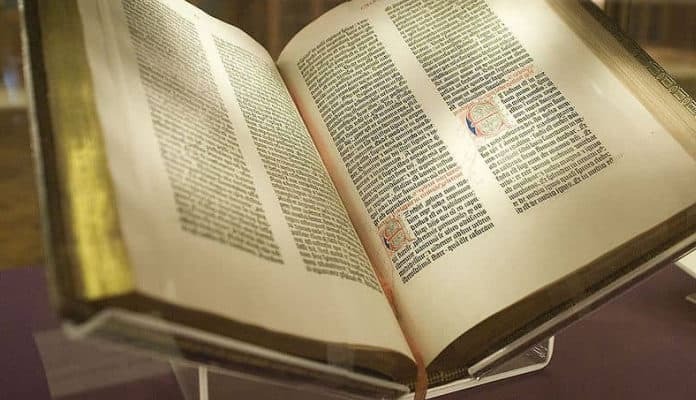 The Gutenberg Bible, on display at the Lenox Library (c. 1455). Wikimedia Commons. “Moses Smashing the Tablets of the Law”, by Rembrandt (c. 1659). Wikimedia Commons. The Ten Commandments, brought down by Moses from Mount Sinai, are a composite set of religious principles which form the ethical fundamentals of the Judeo-Christian tradition. However, despite this centrality to both Christianity and Judaism, the Ten Commandments are not unique to these world religions, nor, in fact, do they originate with them. Predating the incident with Moses, which supposedly occurred in 1490 BCE, the Egyptian Book of the Dead, dating from approximately 2600 BCE, bears noteworthy similarities. Whereas Exodus 20:7 proclaims: “Thou shalt not take the name of the Lord in vain”, the Book of the Dead stipulates: “I have not blasphemed”. Other transparent parallels with the Egyptian religious text include “I have not committed adultery” and “I have not stolen”, mirroring Exodus 20:14 – “Thou shalt not commit adultery” – and Exodus 20:15: “Thou shalt not steal”. Not merely borrowed from the Egyptians, the Ten Commandments also draw inspiration from the Code of Hammurabi dating from 1772 BCE. Inscribed on a stone stele in a manner similar to that of the Commandments, these rigidly enforced laws from ancient Mesopotamia have been suggested as likewise transitioning beliefs from abstract concepts into solid laws mandating obedience.